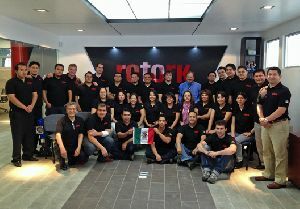 Rotork is proud to announce the opening of its new Valve Automation Centre in Mexico. Strategically located in Mexico City, it is the first full shop facility for Rotork in the country. The 1360m² building houses the new headquarters for Rotork’s Mexican subsidiary company, incorporating inside sales, contracts, after sales and service departments as well as a training centre for customers and end users. The new factory and warehouse is a complete service and overhaul facility equipped with large overhead cranage capacity and full electrical, pneumatic, hydraulic and gas power supplies. The factory will focus on actuated valve factory fit operations and carry comprehensive stocks of actuators, gearboxes and key spare parts to provide swift deliveries to customers. These include PEMEX, the national oil company, and CFE, the national power company. The number of employees in Mexico is expected to nearly double in 2014 as Rotork continues to increase its market share in the country’s utilities and industries including mining, marine and steel.